So this is one of those dishes that will make you say a dirty word when you taste it. It is %$(*#ing awesome. And there are like 5 ingredients. So simple. The secret to the flavors in this soup is in the technique. 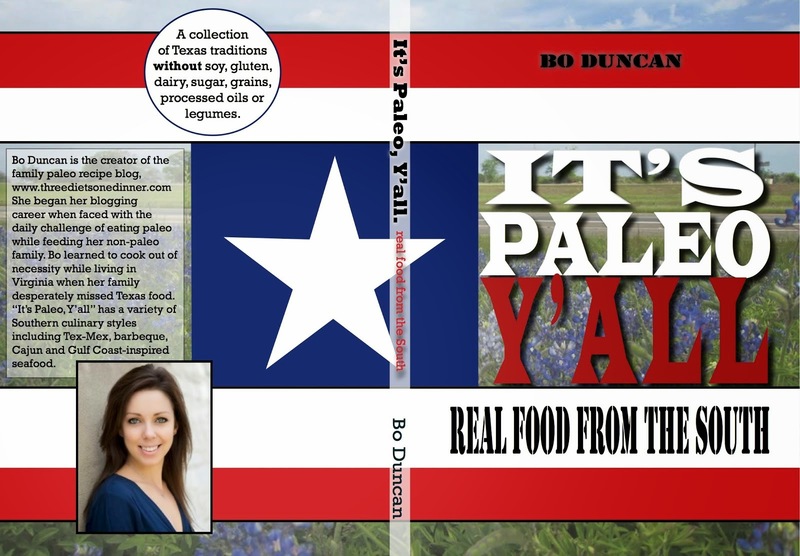 You must use a cast iron skillet and you must use bacon fat. The sweetness in the butternut squash depends on its TLC in the cast iron skillet. The rest is just details. Heat bacon fat in your cast iron skillet over high heat. When it is nice and hot, carefully add the butternut squash (I have some nice grease-burns on my forearm for skipping the careful part). Add a good amount of salt (2 Tbsp). 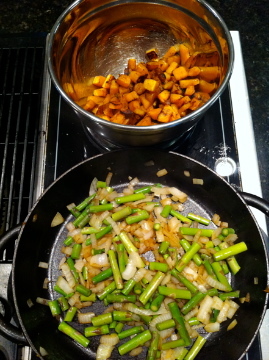 The salt will bring all the natural sugars out in the butternut squash. Continue to cook over high heat for 10 minutes, stirring almost constantly ever-so-gently. You want the chunks to brown up on all sides. Reduce the heat and cook 15 more minutes, stirring gently a couple more times. Remove the squash to a large bowl. Meanwhile, divide the asparagus. You need about 3/4 of it for the soup and 1/4 for garnish. Chop 3/4 of the asaparagus. Add the chopped asparagus and onion to the skillet. Cook over medium-high for 10 minutes, stirring often, until soft. Add the chicken broth and bring to a boil. 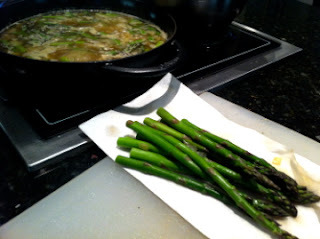 Add the rest of the asparagus spears and blanch in the broth for 1 minute. Remove the spears. Set aside. Pour the remaining mixture into the bowl with the butternut squash. Using your immersion blender, food processor or blender, puree it up! 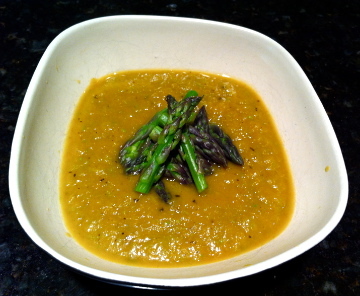 Chop up the reserved asparagus to serve on top of the soup.